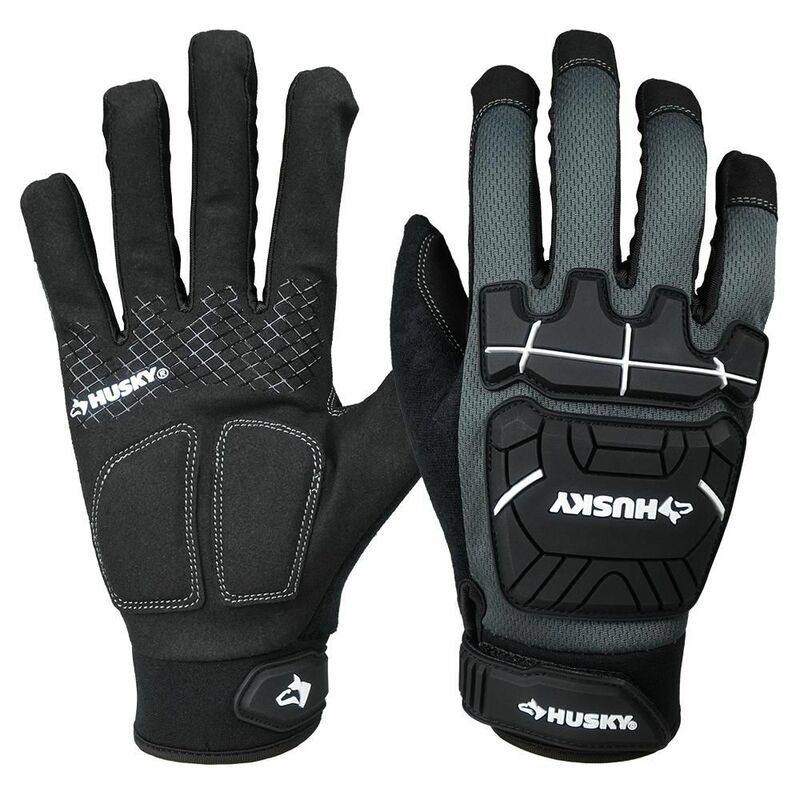 Husky Heavy Duty Mechanics Gloves are a premium series of gloves for all tasks. The gloves have reinforced fingertips for enhanced durability. The neoprene wrist ensures ultimate comfort. The 4 way spandex ensures elasticity throughout the entire life of the glove. These gloves have the addition of knuckle protection to protect hands during the toughest jobs. EGO's goat skin work gloves are designed to protect your hands and reduce vibration. Made with soft goat skin leather to provide durability and breathability, while the padded palm and knuckles help provide reinforced protection. The spandex stretch panels between the fingers help create the perfect level of comfort and ventilation and the adjustable elastic wrist bands make for the perfect fit needed to tackle any task. Heavy Duty Mechanics Glove, Large Husky Heavy Duty Mechanics Gloves are a premium series of gloves for all tasks. The gloves have reinforced fingertips for enhanced durability. The neoprene wrist ensures ultimate comfort. The 4 way spandex ensures elasticity throughout the entire life of the glove. These gloves have the addition of knuckle protection to protect hands during the toughest jobs. Heavy Duty Mechanics Glove, Large is rated 4.1 out of 5 by 43. Rated 5 out of 5 by Tpk08210 from These gloves fit great and are not too bulky for... These gloves fit great and are not too bulky for working with them on. Rated 4 out of 5 by Danny from Gets the job done! Comfortable and I recommend them... Gets the job done! Comfortable and I recommend them highty! Rated 4 out of 5 by Silvercastle from Great pair of gloves. I use them on job sites and they hold up great. Great pair of gloves. I use them on job sites and they hold up great. Rated 5 out of 5 by HomeDepotCustomer from Good fit and they were easy to manipulate tools and... Good fit and they were easy to manipulate tools and other items. I would buy these again!